The HTA is the teachers union at HCS. President Harry Jarcho (left) and Treasurer Gina Torre (right) delivered the funds. Food Cupboard Director Suzanne Collins said her organization serves about 40 families with its summer program. The Food Cupboard also provides food for a summer feeding program in Madison. 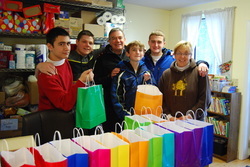 Just before Thanksgiving break, HCS students raised money to benefit a community institution that aids those in need. 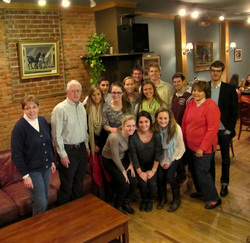 Members of Kathy Roy's accounting class held a cookie sale at the Knight's Nook, the school's student-run store. They raised $140, which they donated to the Hamilton Food Cupboard. 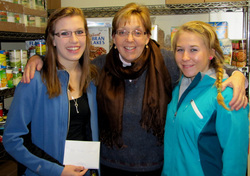 Meghan Holcomb (left) and Ashlee Prentice (right) presented the money to Food Cupboard Director Suzanne Collins on Saturday afternoon. The Earlville Opera House and Treasures of the Heart of NY will host two concerts to raise awareness about local hunger issues and to benefit local food cupboard, including ours. 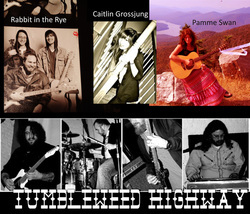 The first concert Saturday, May 4 at 7 p.m. features local musicians Tumbleweed Highway, Rabbit in the Rye, Pamme Swan and Caitlin Grossjung. The goal is to expand support for Madison, Hamilton and Earlville food cupboards. In Madison County, 12 food pantries -- including ours -- served 8,025 families (29,125 individuals) in 2005. Last year that number grew to 13,387 families (44,078 people). A 60 percent increase. The May 4 concert marks the release of a new Treasures of the Heart of NY CD of original and traditional music in support of local food cupboards. The musicians on the annual collection of tunes, each donate their work to this worthy cause. In fact, there are so many musicians donating to this amazing cause that they could not all fit on the compilation CD. There are more tunes available to download. The CD may be purchased at www.treasuresintheheartofny.org. Tickets for the concert are $8 adults and $5 students/youth are on sale now at 691-3550 or www.earlvilleoperahouse.com. Seating is reserved with premium seating in front rows. A second concert is planned for later this year. A group of Colgate students affiliated with a coffee and tea company founded by alumni is joining forces with the Hamilton Food Cupboard to help ensure local children have proper nutrition once school lets out. Students who are "ambassadors" for Shapna Coffee and team met recently with Food Cupboard officials at the Barge Canal Coffee Company to discuss what could be done. "I feel that the summer lunch program is a very important in helping the families in need in our area by providing healthy lunches throughout the summer," said Food Cupboard Executive Director Suzanne Collins. "Partnering with Shapna will enable us to build a stronger program." Katherine Schultz, one of the Shapna ambassadors said, "The gathering at the Barge was an effort to solidify the unity of Shapna and the Food Cupboard on a project for a summer lunch program for students from Madison and Hamilton. "Shapna is not only donating money, but they are also donating their time in the form of outreach in order to get more companies in the community to donate food for the summer lunch program."